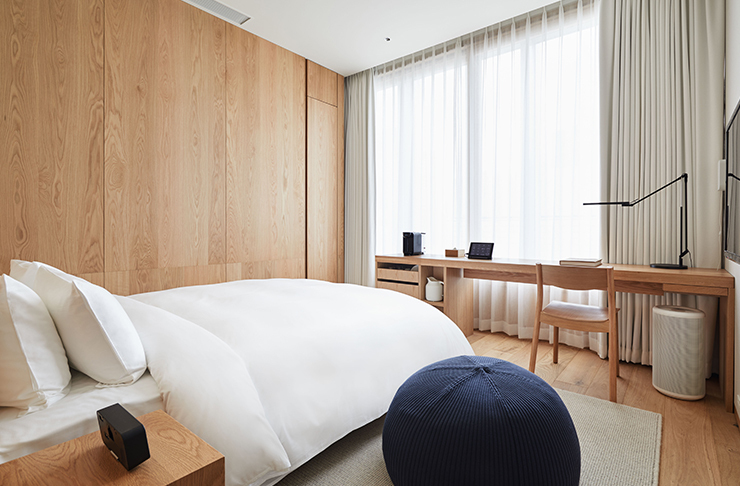 Everyone’s favourite label-less label MUJI has just opened its first domestic hotel, and they’re doing things a little differently. Occupying the seventh to the tenth floor of the monolithic complex is where you’ll find the hotel’s 79 rooms, which come in nine styles, titled Type A to Type I. The compact, elongated rooms feature slightly different layouts, from family-sized spaces to bunk-bed rooms for travelling friends, solo studio spaces, and breezy couples’ hideaways. The highlight, however, is the traditional ryokan-influenced suite which comes complete with floor to ceiling bookshelves stocked with designer hardbacks and a cosy tatami mat reading nook to devour them on. 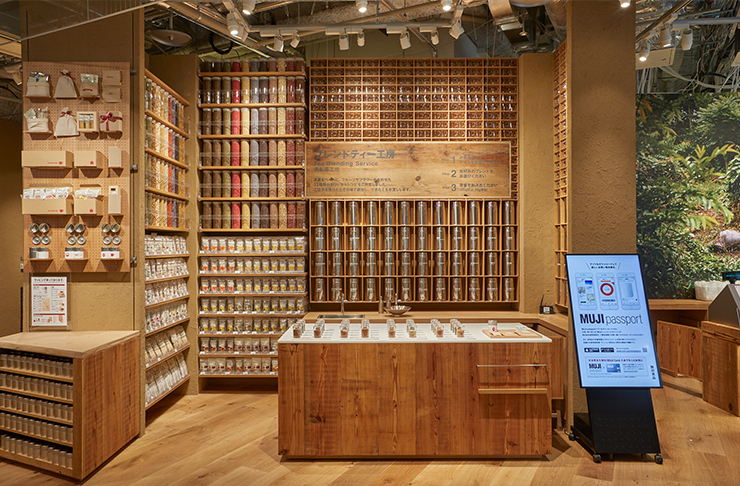 The hotel represents more than just another product in the MUJI family; it’s set to become a little bit of a social experimentation lab for the company itself. According to Satoru Matsuzaki, the president of MUJI's owner company Ryohin Keikaku, the hotel will also be a place for MUJI to develop and trial new lifestyle products and expand beyond the everyday consumer goods which the brand has pretty much nailed anyway. From the furniture and linen and down to the complimentary snacks, the room is stocked (as expected) with MUJI products. But if there’s a product you’re after that you can’t find in your suite, the hotel staff can deliver it from the shopping complex stairs, right to your door. Also on the sixth-floor hotel space, is the traditionally-influenced Japanese restaurant WA and Atelier MUJI Ginza, a multi-purpose facility dedicated to design and culture. 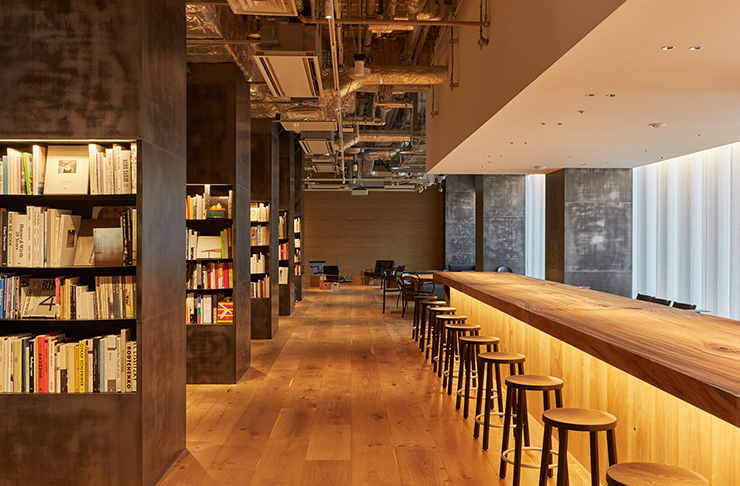 The Atelier MUJI Ginza features a large round communal table for meetings and studying, two galleries, a salon, a library, and a lounge space with a bar serving drinks until 2am. Room prices start at 14,900 yen ($188) per night for a semi-double and have been priced in a way to offer an affordable alternative to the more expensive luxury hotel options on the market. In another notable move that’s so very MUJI, the hotel promises that the cost of the rooms will remain inflation-free and stay the same rate throughout the year, regardless of holiday seasons, and weekends. Reminiscent of the stores, each of the rooms are bathed in the soft glowing light and finished with hardwood floors, muted neutral colours and organic textures like wood and stone. The stone sourced for the hotel is mostly recycled materials, including old paving stones from Tokyo’s public transport system. In a bid to help make the notoriously plastic loving Japan more eco-conscious, accompanying the opening of the hotel was the announcement that the hotel and store will be switching out all their plastic bags for paper ones, a move that will soon be implemented globally. Heading downstairs, levels five and below belong to the brand’s newest global flagship outlet, and put simply; it’s MUJI supersized. It boasts its own Bento Store, Juice Stand, Aroma Bar (where you can create your scent blends), on-site Styling Advisors, a MUJI Diner, Tea Blending Service and a MUJI Bakery (serving fresh bread and pastries daily from 7.30am), and a grocery store selling vegetables sourced from local farmers. It’s just one more reason to get to Japan... as if you needed one anyway. 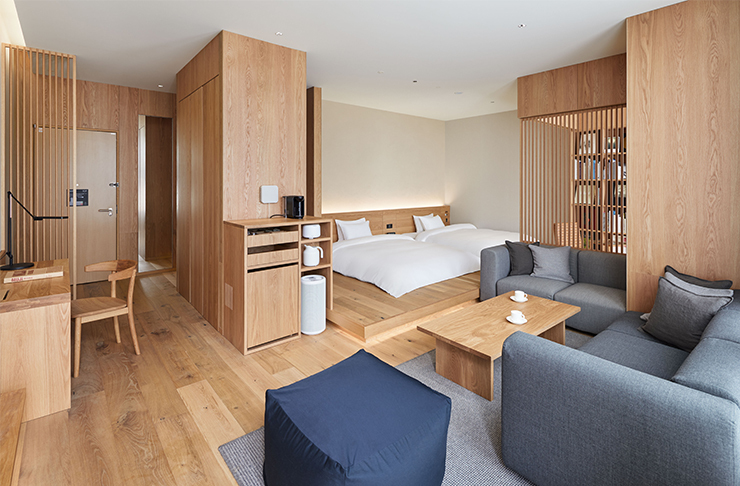 The MUJI Hotel Ginza is now open for bookings.